Don’t compromise when it comes to coffee – make sure your morning brew tastes as good as it can with Bodum’s Brazil French Press Coffee Maker. 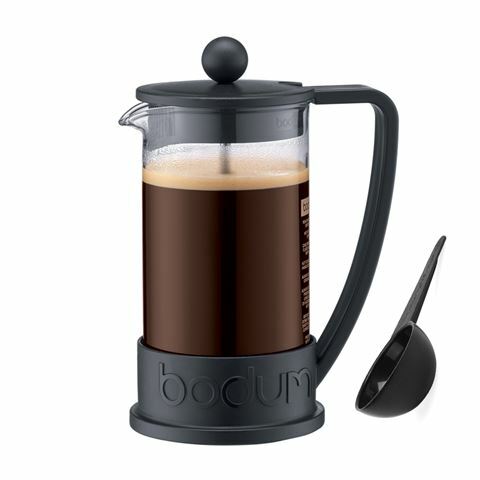 First conceived in the 1980’s, this compact coffee maker is equipped with a heat-resistant borosilicate glass beaker and requires no additional paper filters – just add boiling water, coarsely ground coffee and slowly press the plunger down. Before you know it, you’ll be sipping on incredible tasting coffee in no time, thanks to Bodum. Crafted from stainless steel, borosilicate glass and durable materials. Easy to use plunging system. To use, add coarsely ground coffee, hot water and stir. Leave for four minutes and slowly press the plunger down.